Summer just got hotter because of Greenwich! I know this season is all about family and friends as we all try to beat the heat by going to the beach, somewhere cold or going on different adventures. 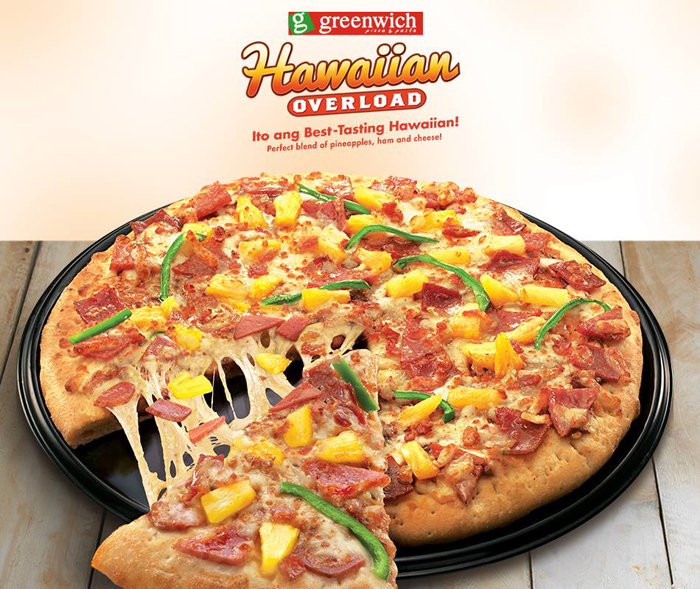 Get a jumpstart on your craziest summer yet with Greenwich's best-tasting Hawaiian Overload Pizza! Topped with the perfect blend of meaty slices of ham, sweet and juicy pineapple and finished with slices of green bell pepper, this delightfully tasty and cheesy pizza truly brings out thoughts of days spent at the beach or lounging on a cool mountaintop with friends. Now, here's some good news... Greenwich wants to treat you and your barkada! You and your barkada (minimum of 3) could win P5,000 worth of Greenwich GCs! 1. Upload a photo of you & your barkada on Instagram. Easy peasy! Team with most number of hashtags wins! Let's do dizzzz. Kaya paaa. Haha. Spot the Combi van in the venues and start your #PinaghaHawaiian challenge. Simply register and claim your FREE freshly made Greenwich #HawaiianOverload Pizza. Take that perfect #groupfie with the Greenwich Hawaiian Overload Pizza Combi Van, post it on twitter and/or Instagram and tag @greenwichpizza. Use the hashtag #PinaghaHawaiian so you can always go back to your best summer start. Complete the challenges within the given time at the counter to win even more prizes. More photos from the SM Megamall activation! Free slice of pizza for those who registered! Team #AwowLuau with the Luau girls. Hehe. Go team!! :) Winning ang photos!! One of my favorite pizza places when I visit the Philippines! Very nice blog, Aisa. I look forward to reading it further. Hope you can visit my blog sometime in the future. Wow! I always love greenwich, I really hope I can tag along my barkada with me and join this contest :) Nice team you have Aisa!